We finally found time to rephotograph most of our available rainbow boas and, whoa, what a difference in just four months! The top photo was taken 9/30/18 and 1/19/19 for the bottom photo. Both photos were taken outside in our backyard with the same phone. We also uploaded pics of our hypo and het hypos. 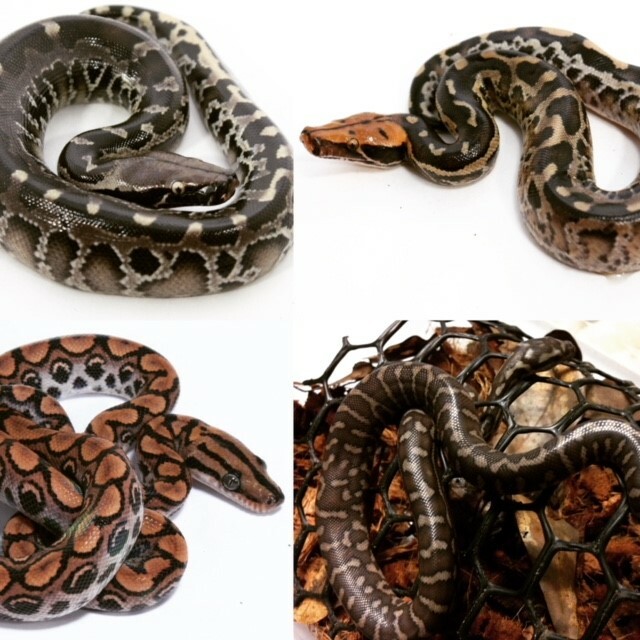 All of our CB Sumatran short-tails have shed and are ready for new homes! They hatched over the summer and are currently eating ALL of our small f/t rats! We have chrome-heads, solid blacks, and some with marvelously marbled tails. They’re finally here! We just had a large litter of Brazilian rainbows born here at Hardin Herp. You can predict when babies will be born by watching the weather and your animal’s behavior. Thunderstorms are a good indicator to watch for neonates. I’ve observed this many times over the years. I believe the barometric pressure elicits the birthing process because the fresh rain water helps wash the smell of amniotic juices away from the vulnerable newborns and mother. These guys will be looking for new homes soon, message me if you’re interested! 2017 is almost over, and what a year it was! We produced more boas and pythons than ever before. This feat proves that the constant tinkering, fussing, and fine tuning of our animal's husbandry has resulted in happier and healthier herps that produce great looking offspring. We hope that next year we are able to produce even more healthy captive born herps. Doing so will saturate the market with animals that are better equipped for a long life in captivity. One of my pet peeves is seeing wild caught, sickly, freshly imported ectotherms being hawked at reptile shows or online. These animals almost always inevitably die. This is unfair to the herps and it discourages new hobbyists from further keeping these awesome pets. It is our duty as reptile lovers to support captive production and to stop the unsustainable wild-collection of herps. Of course, there is always a time and place for sustainable wild collecting. There is a lot of downtime this time of year which allows me to reflect on the present and future of our hobby. Once spring rolls around and the snakes come our of hibernation I'll be too busy to climb onto my soapbox! Thank you to all that helped make 2017 one of the best for Hardin Herpetologica! Our last eggs for the year have pipped and we are preparing to photograph and upload lots of available animals now that they have fed, shed, and are ready to find new homes. We have Centralian pythons (Morelia bredli), Brazilian and Colombian Rainbow boas, and another clutch of Sumatran short tail pythons that I will be uploading soon! Stay tuned! This is one of the busiest time of the year for us here at Hardin Herpetologica; babies are hatching daily, reptile shows are eating up our weekends, and we got lots of emails from great folks wanting to adopt a new scaly friend! With it being so busy Trace decided it would be a great time to leave the country for a couple weeks! He was asked to travel with the great folks of the Honduras Amphibian Rescue and Conservation Center as their resident entomologist. This is an amazing conservation project that some of his best friends are running; Brandon Greaves (Omaha Zoo) and Jonathon Kolby (Instagram @myfrogcroaked). As you may know, amphibians are in trouble! Nearly 40% of all species are threatened with extinction; this is due to habitat loss, climate change, and a deadly fungus spreading throughout the world, chytrid. 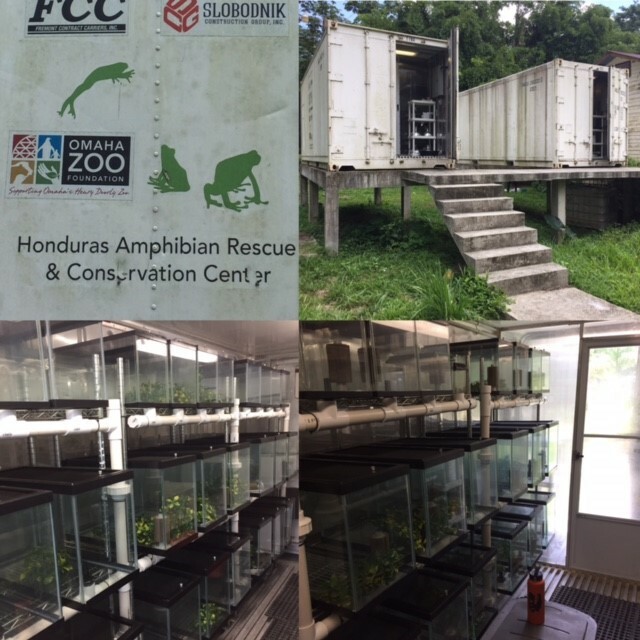 The HARCC team is hoping to collect infected amphibians from a biologically diverse "hotspot" in the cloud forests of Cusuco National Park, Honduras. Once collected they will be transferred to a state-of-the-art "mobile laboratory" made from shipping containers. Here, the frogs and tadpoles will be fed, treated, and released back into the wild. It appears that the chytrid fungus is most devastating to freshly metamorphed froglets, if we can assist this transitional phase and allow more to survive we will give natural selection a helping hand. Amphibians are threatened because of humans, the least we can do is try a last ditch effort to help them out. 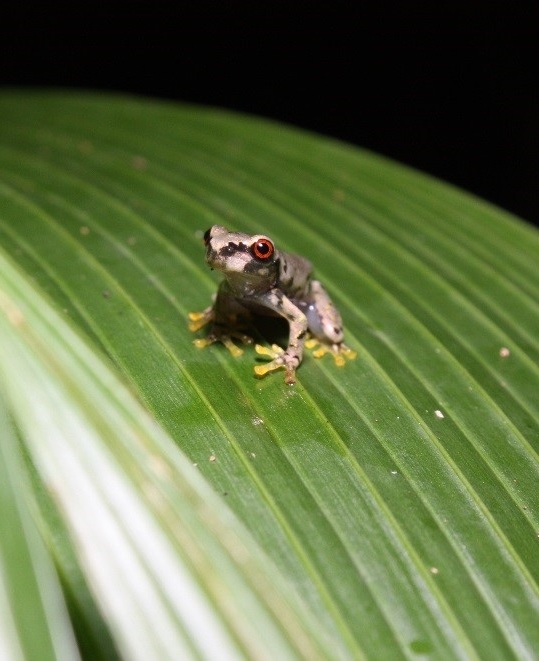 As an entomologist and avid herper, Trace was asked to help establish cultures of insects for the frogs to feed upon and assess current frog populations in Cusuco National Park. What an experience! The baby racks are starting to fill up! We've already had a few litters of Brazilian and Colombian rainbows born and Sumatran short tail pythons are beginning to pip. Once these little guys shed and start feeding, they'll be ready for new homes. We have so many gravid Brazilian rainbows right now! Below are the pairings that are expecting. Email us at sales@hardinherp.com and/or follow us on Facebook to be notified when the litters arrive. They're heeeeere! Nope, not a poltergeist... It's our first clutch of the year! We can't wait to watch these beauties peek out of their eggs very soon. Contact us at sales@hardinherp.com to be placed on a wait list. 2017 is here and we are excited about the possibilities this year will bring! We are passing on this excitement by offering… drum roll, please… $25 shipping* on all purchases! Below is a sample of what is currently available. For those interested in a rainbow boa, be sure to saunter over to the TERMS & HUSBANDRY page to check out the Epic Epicrates Care Sheet for tips on how to properly care for these amazing snakes! *During the winter months, we can safely ship out when the temperatures are above 40 degrees in the locations of the seller, buyer, and FedEx hub. However, we will gladly care for your purchased snake until the weather conditions are favorable. It’s that time of year again.... baby season!!! We have been busy taking pictures of each and every little one. These cuties are looking more colorful and vibrant with each shed. Check out the Available section to view the offspring from this year’s unique pairings and updated photos of the 2015 babies! Or, see them in person at the NRBE in Daytona on August 19th-21st! When the tax season ends, we know baby season is around the corner. We are making some room for our new bundles of joy by cutting out the 2015 babies that have not completely switched over to frozen/thawed. As much as we adore them, we just do not have the access to live feeders to accommodate them. Also in honor of everyone's favorite day ;) we are offering $18 off our other available animals now through the end of the month. So be sure to check them out! Our loss is your gain! As crazy as it has been around here, we pounced on the opportunity to take updated photos of our current stock and newly available babies. FYI, we will be repricing our Brazilian rainbow boas after the new year to reflect their increasingly gorgeous appearance; take advantage of these newborn prices now! Here is an OH SO SWEET morsel of our available section! We have so much happening right now! After recently accepting a promotion that will take us to South Carolina, we decided to celebrate with a quick AND cheap trip to Costa Rica with some awesome Florida friends. The excursion was our second visit to the beautiful country and we were not disappointed! Costa Rica’s rain forests are a biological dreamland with the amazing flora and fauna! Check out more pictures on @HardinHerpetologica and @biofab138! As I mentioned, we are moving to South Carolina. If you have been on the fence about making a purchase from our Available section, NOW is your time! We want to move as few animals as possible so prices are negotiable! Feel free to make an offer! The St Augustine Reptile Show is this weekend in Florida. My wife will be vending the show on my behalf as I am at a conference in my old stomping grounds. It's so great to see the Omaha Zoo again! It's enrichment day in the snake room! We hid thawed small rats in 3' cardboard tubes, then stuffed both ends with newspaper. This makes it difficult for the snakes to get to their prey. It's like watching kids open presents on Christmas morning! It's important to mentally stimulate captive animals through exercise, a varied diet, and enrichment. We could not think of anyone better than the incredibly talented Isaac Powell to draw up a #NaturalHistory sketch of this #Epicrates head for our future Hardin Herpetologica t-shirts. Follow him @biofab138 to check out his amazing art and catch a glimpse of the natural world through his eyes. You won't be disappointed! We've been busy taking and uploading pictures of our most recent litters. 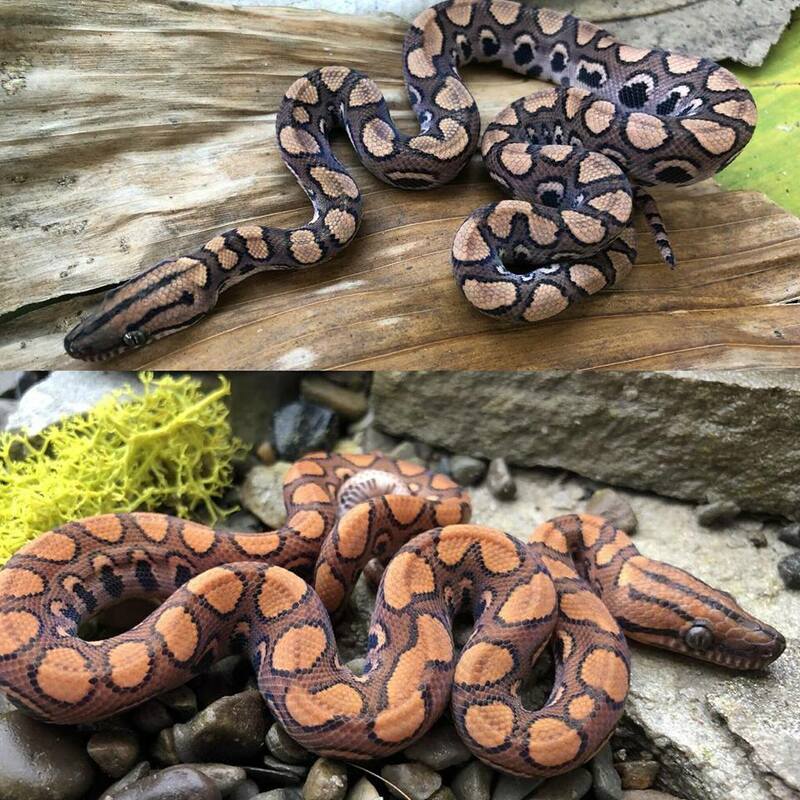 Check out the Available section to view pictures of our Leucistic & het Colombian Rainbows, Pumpkin-headed Short Tailed pythons, and Brick Red X Hot Tamale Rainbow pairing! Also, we will be at the Jacksonville Repticon on September 26 & 27 so be sure to stop and see all of these baby beauts in person! Another large group of ravishing rainbows are shipping out today! We're always sad to see them go, but need the cage space for new projects. So help us make more room by checking out what is left in our available section including the adorable knob tailed gecko that you see below! ;) If you are headed to the FIRExpo in Lakeland, FL this weekend, don't forget to stop by our table and say hi! Pumpkin Spice Lattes delayed for one week? Well, our Pumpkin Headed Sumatran Short Tailed pythons are right on time for the upcoming FIRExpo in Lakeland, FL on September 12 & 13! Here is a sneak peek of the perfect Halloween treat if you are unable to see them in person at the show! Vending at the Daytona NRBE was a great time! We enjoyed seeing familiar faces and meeting new people. Thank you to everyone who stopped by our table! We still have many snakes for sale. The babies are growing fast and look brighter with every shed. I could not help myself from taking a quick pic of this little one. The offspring from the Cedar Chest x Pearl pairing started as golden honey cuties and are turning into brilliant orange beauties! Check out our Available page today! I recently returned from the Invertebrates in Education and Conservation Conference in Arizona. This was one of my best herping and bugging trips! We saw numerous rattlesnakes, odd colubrids, and tons of cool beetles! Check the Available section as we upload baby snake pictures and prices. We appreciate your patience while we slowly piece together the new site! Shoot me an email with questions or offers! We revamped the website just in time for the new baby season. As you can see from this leucistic Colombian rainbow boa, this season is proving to be a great one! We will be showcasing the offspring as they shed and begin to eat. Be sure to "Like" us on Facebook and follow us on Instagram for the latest news! I still have some 2014 babies looking for good homes. Check out the Available section for individual pictures by clicking the image above! I just posted some new pictures of blood pythons in my Available section. Two different bloodlines both captive born here in the good ol' US of A! Why waste time with stubborn feeding, farm-raised babies that usually turn out brown when you could have these little orange and red bloods?! Welcome to the new year! I introduced the males to all my females over the holidays, a little gift to all of them! Lots of activity so far this season. I even discovered that my 1.2 black head pythons are actually 3 girls. I got a male so hope to produce some babies this season, finally. I rephotographed all my available animals and put them in the Available section. Some of these guys have really colored up since when they were born and others have never been available before. Below is an amazing hypo I produced last year. Some of the babies that are currently available may grow into similar looking adults.